It is with profound sadness that the Foundation announce the passing of Lady Mary Fairfax, AC OBE, Founder and Life Governor of The Opera Foundation for young Australians. On Sunday 17th September, Lady Fairfax AC OBE died peacefully in the family home, “Fairwater” and had recently celebrated her 95th birthday. The Opera Foundation for young Australians was created by Lady Fairfax AC OBE in 1963 with the vision of providing international opportunities for young Australian opera singers to gain experience and return to the Australian stage to enhance the art form. Lady Fairfax AC OBE is fondly remembered by all for her enormous philanthropic generosity to many charities including supporting her passion for the Arts. 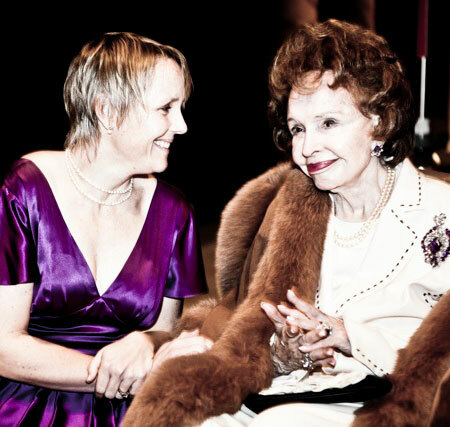 In 1963, my mother, Lady Fairfax AC OBE founded Opera Foundation Australia. Her leadership, vision and support has enabled the Foundation to develop a strong, credible and lasting reputation in providing international operatic awards and scholarships to young Australian operatic artists. To date the Foundation has provided over $5 million in funding and support and offered over 300 Awards and Scholarships. Importantly, the core role of the Foundation is as relevant today as when first identified by my mother. The reason being what we do continues to be unique in Australia and we want to make sure our name best represents this work and clearly stands alone. Our uniqueness is that we offer awards and scholarships that open doors to the world of opera for all types of voice types as well as conductors, designers, directors and repetiteurs. We continue to only do this for our young Australian artists. Artists of all backgrounds who often don’t have access to the make or break learning opportunities that can really help them grow and further their careers. The foundation has an impressive alumni of past winners. For instance in 2016, we have over 10 of our past winners starring in principal roles across our national opera houses. Internationally, our past winners continue to shine. In addition, we are honoured to have the Vice-Regal Patronage of the Governor of NSW, His Ex-cellency General The Honourable David Hurley AC DSC (retired) and Mrs Hurley. The Foundation does not receive any government funding and continue to fund our awards and scholarships throughout the generosity of individual supporters and philanthropic foundations whom believe in what we do. Thank you for visiting The Opera Foundation for young Australians and we hope to see you at our Soiree or finals concert in the new year. Would you like to contact our organisation?